Hill City House Grille hosts a Martini Night on Wednesdays that kinda, sorta doubles as a “Girls’ Night Out.” To up the ante, they’ve got local country-music wunderkind Zach Burnette booked to play his version of swinging, bluesy, and sometimes even a bit boozy Americana classics just about every Wednesday for the foreseeable future. The martini specials are just five bucks, and Zach’s a mighty handsome dude, who looks the part of a young and hungry Nashville star. Speaking of hungry, the Hill City bar menu features wings and other tasty things. The action starts at 7 p.m. and runs until 10 p.m., and there’s no cover charge. The Hill City House Grille is located at 7001 Timberlake Road in Lynchburg; call (434) 237-6110 for more info. Imagine peering out over the vast and varied London skyline. Imagine it’s all made of LEGOs. Now, imagine that you get to build it. That’s the plan, as Barnes & Noble hosts its second Skyline Build this evening from 7-9 p.m. Participants will work together to create the skylines of two great cities, London and Chicago, for the store’s new displays. Tables will be set up for the construction project, but, if they become too crowded, you can always browse the store’s selection of more modest LEGO architecture kits. We hear they have books, music, and other stuff too. They’ll also have an area set up for kids, presumably with the chunkier Legos that are harder to eat. The café will be open for the duration of the event. The store is located at the Wards Crossing Shopping Center, 4024 Wards Road; call (434) 239-8688 for more info. Tired of battling dragons whilst sipping from a sacred pewter chalice all by your lonesome? Who wouldn’t be? Thankfully, Untamed Worlds has a potential alternative for those inclined toward wizards and warfare. Every Wednesday, the gaming and comic book hotspot at Timbrook Square Shopping Center hosts a board game and role-playing night. Here’s how it works: store regulars bring in games like Settlers of Catan, Ticket to Ride, and Munchkin, invite others to join in, and the competition commences. Store owner Chris G. insists that it’s a great event for families looking to get out and try something new, or even something familiar with a twist. Snacks and sodas are available for purchase from the front counter, and participants are welcome to bring their own games. It starts at 6:30 p.m. and runs for as long as it has to (roughly three hours). Untamed Worlds is located in Timbrook Square Shopping Center, 20722 Timberlake Road #K, Lynchburg; call (434) 237-7115 for more info. First Fridays in Lynchburg generally means that there are at least a few downtown businesses hosting something a little special. 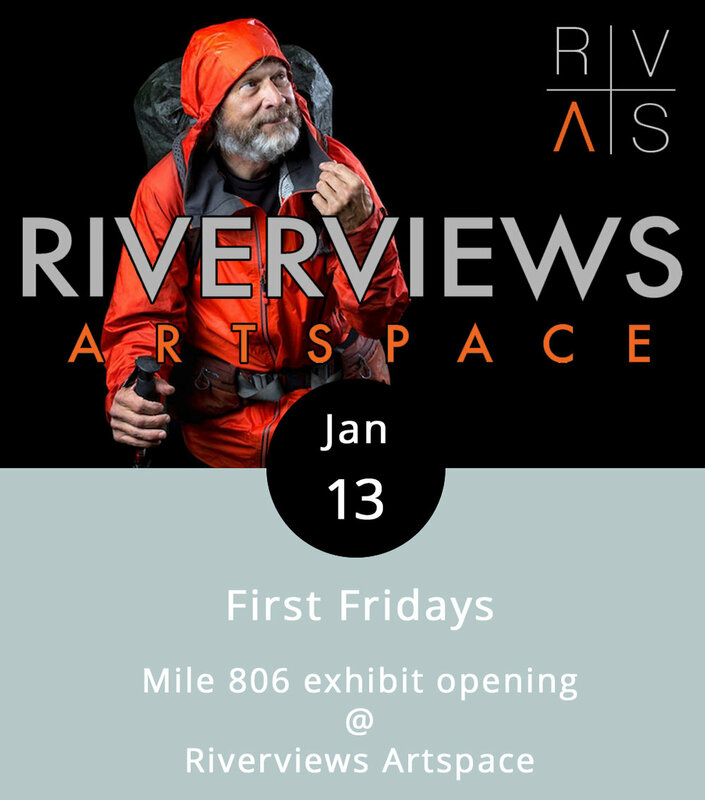 But what you can almost always count on is a First Friday reception for a new exhibit in the Riverviews Artspace Craddock-Terry Gallery, and open studios in the building’s artists’ spaces. This month’s exhibit poses the following question: What awaits the lone hiker at Mile 806? The answer lies in the images that local photographers Parker Michels-Boyce and Chet Strange captured of hikers they encountered at mile marker 806 of the Appalachian Trail. Those photos will be on display in the main gallery, which opens at 5:30 p.m., and the photographers will give a joint talk on their project at 6 p.m. This is the first exhibit of an “Emerging Artist Series,” and it’ll be up through February 16. The gallery is open Wed.-Fri., noon-5 p.m. Riverviews is located at 901 Jefferson Street; call (434) 847-7277 for more info. We thought Repair Café would make for a good band name. Instead, it’s a rather unique and coolly conceived event that doubles as an opportunity for those of you who might have a broken blender or some other malfunctioning appliance you’ve been meaning to fix for longer than you care to admit. Vector Space is a relatively new, nonprofit “makerspace” that allows members to drop by and work in shop areas devoted to woodworking, machining, textiles, and electronics. For the first First Friday of 2017, Vector Space is opening its doors and lending its members’ expertise to aspiring tinkerers who’d like to try their hands at repairing broken items. The organization’s Executive Director Elise Spontarelli promises that at least four professional “fixers” will on hand to help out from 5-8 p.m. There won’t be any food – it’s not that kind of café – but participants are welcome to bring their own refreshments. Vector Space is located at 402 Fifth Street; call (804) 387-1519 for more info. Singer-songwriter Josh Walker has a mighty beard to go with his mighty voice, and at least one blue acoustic guitar that we know of. Stylistically, he’s rooted deeply in Americana, which translates to songs by Amos Lee, by former Drive-By Trucker Jason Isbell, and by Walker himself, who’s got a timely sing-along about politics that suggests a kind of bipartisan consensus. Walker also likes to break out tunes he grew up on, including classics by the Eagles, Tom Petty, and Green Day. He’s holding down the corner spot at Dish tonight for the downtown restaurant’s Thursday “Local Lounge.” The music runs from 8-11 p.m., so the kitchen will be serving a full menu when Josh gets going. Dish specializes in an eclectic array of small plates, which may be the perfect pairing for an evening of casual music. And, the kitchen’s crew chief Dave Ellis was just anointed Best Chef in Lynchburg by readers of The Burg. Dish is located at 1120 Main Street in downtown Lynchburg; call (434) 528-0070 for reservations and more info. Located directly across from the Community Market in downtown Lynchburg, the White Hart Café has food, books, and all manner of coffee beverages, brewed with locally roasted beans from the Blackwater Coffee Company. On occasion, the White Hart also offers live music befitting its folksy atmosphere. Tonight, it’s local singer-songwriter Caroline Guske, whose vocal prowess earned her a spot in the Virginia Honors Choir when she was a senior at E.C. Glass last year. Instead of choir music, she’ll be strumming guitar and playing her own poppy folk music, plus a few select covers. The music begins at 7 p.m., but the White Hart’s open all day, from 7 a.m.-10 p.m. The address is 1208 Main Street; call (434) 207-5600 for more info. To those of you who are new to the site, welcome to LynchburgDoes.com. To those of you who are returning, welcome back. And, thank you. We were gratified and inspired by the response to our launch. We have hundreds of more people following us on Facebook than we expected, and dozens of you have already signed up to receive occasional newsletters and follow the site. We’ve also heard from many of you, and that has all been very encouraging. Turns out, there are lots of things to do in Lynchburg, and lots of people who’d like to know about those things. Our job will be to learn as much as we can about happenings in and around town, and to let you know in a timely, informative, and entertaining fashion. We’re aiming to cover a diverse cross-section of arts and cultural events; nightlife happenings and family-friendly activities; food and drink; stuff you can do on the cheap, and even some pricier things. In short, we’d like to be an easy-to-access hub for thoughtful, illuminating, and engaging events listings that are as detailed, accurate, and up-to-date as possible. We could use your help. Sign up to follow us below. Like us and follow us on Facebook. Talk about us. Post a link to us. Tell two friends to visit the site. Check in as often as you’d like. And, by all means, go out and have some fun in Lynchburg. You can also contact us and send tips to Events@LynchburgDoes.com. We’ll be working on the next slate of events for next week, and on the many design and technical challenges that are just part of online publishing.